One Year of Veggie Velo! Our First Year Anniversary at Veggie Velo. There is so much to talk about! 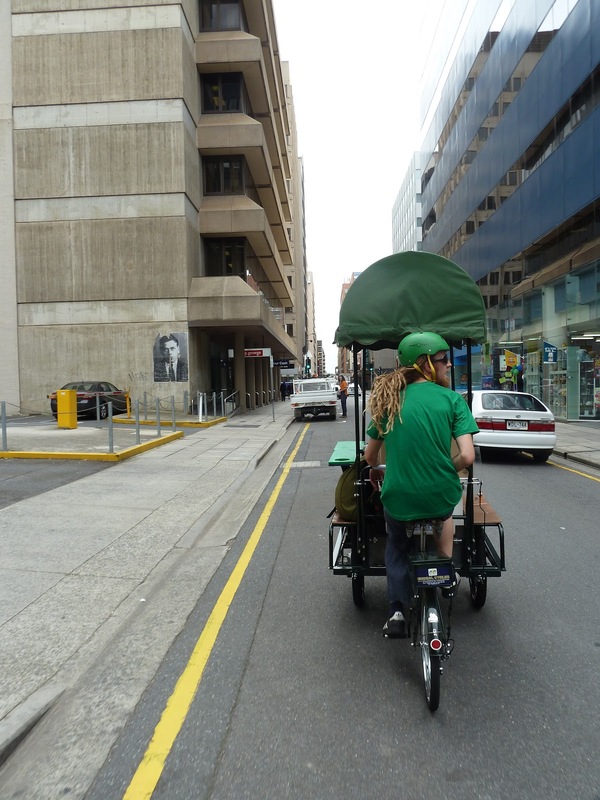 Thank you to everyone who have made Veggie Velo a success, we are really grateful for the support we have been shown by the citizens of Adelaide, by the Adelaide City Council and our friends and families! There are too many of you to thank individually but we hope you all know we appreciate your support and encouragement and couldn't do it without you. We had a 1 year Anniversary party in Lindes Lane off Rundle Mall to celebrate, and were really happy to see so many customers and friends come and help us party. The weather was as equally inviting (!!) as one year before when we launched Veggie Velo, but we had quite a few more customers this time. Big thanks to James, Darren, Sam and Danni for helping us on this day! Flamin' Weiner and Smooth Revolution are amazing bicycle food vending businesses. James at Smooth Revolution showing age and size is not an issue for making a good smoothie! Darren and Sam at Flamin' Weiner, Thanks guys! It was so great to see so many of you! Thank you for coming! Conrad and us saying Hi and 'We miss you' to Chloe! Thank you for the present Sophia! We were excited to show our new Cake Bike for the first time! Cake Bike is all vegan all the time, with our apple crumble on display alongside amazing treats like Salted Caramel brownies and Orange Blossom Sesame cake. First Cake Bike customers! Woo! We also had our friend at the Flamin’ Wiener selling veggie hotdogs, and James at the Smooth Revolution giving away his amazing pedal powered smoothies. As party hosts we gave away free cakes to everyone who came and had a burger for lunch, and we were really happy so many people took advantage and tried some tasty treats. Thanks especially to those of you who gave us presents. We were spoilt! Thank you! Cake bike is my new favourite ride! So glad that I have restored my old blue cargo bike into a sweet ride! We want to promote a vegan diet and through cake bike we can show people that you don’t need dairy or eggs to make amazing sweets. Being so busy with the burgers, I can’t cook all those extra cakes, so I wanted to feature the cooking of some beautiful local bakers on my bike. Pixie at Tasty Goodness (Tasty Goodness on Facebook) has years of experience in vegan cooking and has the most extensive vegan catering menu we have ever seen. We loved her cakes from day one, having tried them at the 2012 Vegan Festival in Adelaide, then at The Elephant Walk Café and The House of Donkey. We are very happy to have her bringing us the amazing choc chilli mousse tart, gluten free cheesecake and more. Ricky from Gourmet Brownies is the living proof that you don’t need any butter to make a good brownie. His vegan brownies are wicked, always with different flavours, just the right size, and very addictive. There will be more to come and we hope that you can enjoy the benefit of a vegan diet, even if it’s only occasionally for you. This year we have seen the councils new guidelines put in place for street vending, and new council fees set up for vendors. There was a lot of discussion about fairness and costs and we are really pleased with the result. 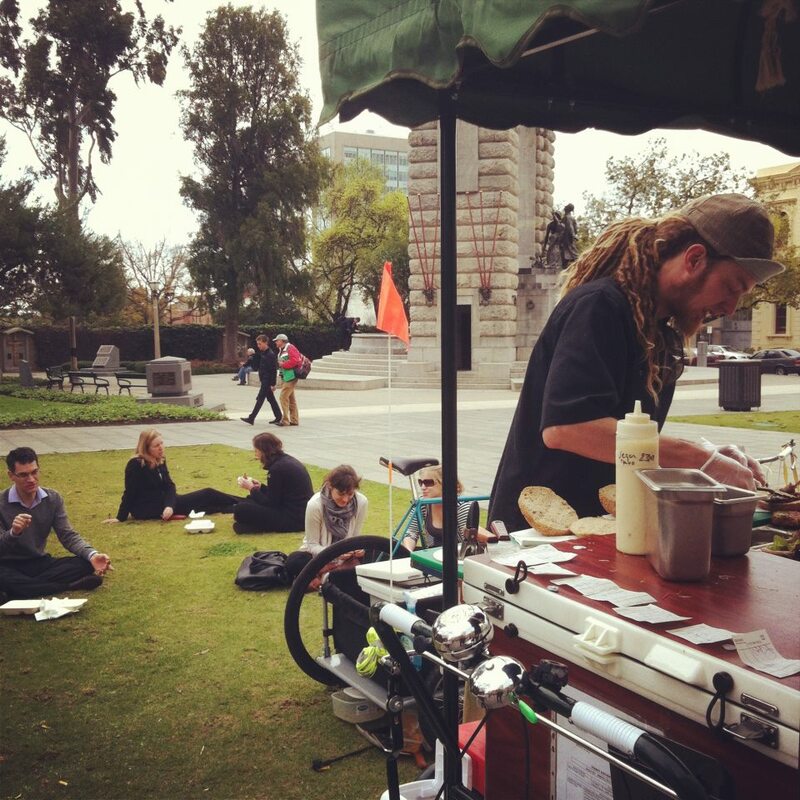 Personally we feel street food vending makes Adelaide a better place, it enhances outdoor spaces which otherwise may not be used to their full potential, and brings food to people in places that might ordinarily not be reached. We are really happy with the positive support from the Adelaide City Council and the Splash Adelaide project, as we feel they are successfully helping to bring this city to life and providing great opportunities for people. We know in other states the laws vary greatly for street food vending, and we think overall in Adelaide there is an open minded and supportive attitude and we love it! We hope the citizens continue to voice their opinions as this is how changes are made. For the next few months we have some exciting events coming up that we are looking forward to. Spring and summer should be a little more enjoyable for outdoor dining too! Well that was a huge few months! The Big Day Out, Adelaide. That. Was. Huge. Fork on the Road, Adelaide, support for this event is of mega proportions. Thank you to everyone who came and bought a veggie burger! Scum Fest. Yep, it was different for us, but the customers were lovely and made our stay at the Old Queens Theatre awesome. ‘Oi You’ Art exhibition opening at the Adelaide Festival Centre, we were so impressed at the number of people who came along to support this festival. Excellent turn out, and a great chance to meet Tash and co. from the Annexe at Glenelg, our Veggie fix at the bay. Mini Maker Faire Adelaide, lovely day of learning new things, and meeting nice people, what more could we ask for? World Vegan Day Festival. Well next time we will certainly bring more food! And last but not least our regular street side service. It’s going well, so many smiling faces and supportive customers- Thank you! Hindmarsh Square, North Terrace, Leigh Street are our favourites and we can’t wait to meet you all! We are still amazed by the huge response to us, and the mobile food vendors of Adelaide in general. It gives us such a positive feeling about the future of Adelaide, a city we feel so happy to be living in! We feel like the people of Adelaide are realising that to cause change they need to be active in making it happen, and that sitting back and appreciating something that’s going on is not enough, you need to be a part of it for it to work. We really believe that as more people are travelling around the world they are not only appreciating what they have here in Adelaide, but are more open to new ideas, and want to bring some of those ideas home. We regularly get people saying they’ve seen vending bicycles in Asian, Europe or America and understand what we are about. It so nice! There really seems to be a buzz of new activity in Adelaide, a momentum we hope continues, and we really want to be a part of that positivity. Before I leave you with some photos from our adventures, I just wanted to make special mention of the charity group Fauna Rescue of South Australia Inc. During the Adelaide Festival we spent one night raising money for this group. It was just a little drop in the ocean of what we would like to do long term, but it was really rewarding. We raised $150 in one night just by donating a percentage of our sales to them. We know that money will go towards feeding animals in recovery, funding vet bills and creating nurturing environments for animals in need of assistance. So good! Thanks to everyone who came and supported us on this (and every) night, and made this possible. Thanks to Robyn Wood from the Fauna Rescue group for helping us organise this! North Terrace, little bicycle food court. North Terrace is a perfect spot! Setting up, Thanks Mum & Dad for the help! October is almost over and we are now seriously starting to cook! What a great few weeks we have had, meeting you all at plant swap meets, in Adelaide’s park lands, Gilles Street Market and today in the University for the first time. The Veggie Velo has been clocking up some miles and Manu has been working into overtime. We had a great morning on International ride to work day, with our first try at something different off the grill, Corn Fritters (vegan) and Banana Pancakes (vegan also). They were super good and hopefully we can do a little breakfast service some time in the future. In the past few weeks we have also traveled to Woodville to be part of a friendly Garden open day at Ridley Grove Community Garden, took part in the city Park(ing) Day and worked the crowd for the march to Solar Power up our state. We even had a pop up park in the East end to help celebrate Irving Baby's 20th (!!) anniversary. Thanks Splash adelaide for the deck chair vibe. We are learning that now we have a lot more sun we need to take cover in the shade, so some of our favourite spots like North Terrace will be moving during summer. We met some great Veggie Burger fans at this spot so hopefully we can find somewhere shady near by. We are also now certain we have the best customers in the world. Not only are you all friendly and patient, you have been giving us amazing feedback and reviews as well. We are sincerely grateful for all of your business and hope we keep you well fed and happy for some time yet. Yelp welcomes Veggie Velo to its pages. Thank you for liking us! One highlight of the past few weeks was meeting and serving Simon Bryant. Ever cooked for a chef? It can be a little nerve racking, but Simon was very friendly and came and complimented Manu and even gave us some beautiful produce from his ‘Dirty’ range, Lentils and Chickpeas. We are now fans of those as well. 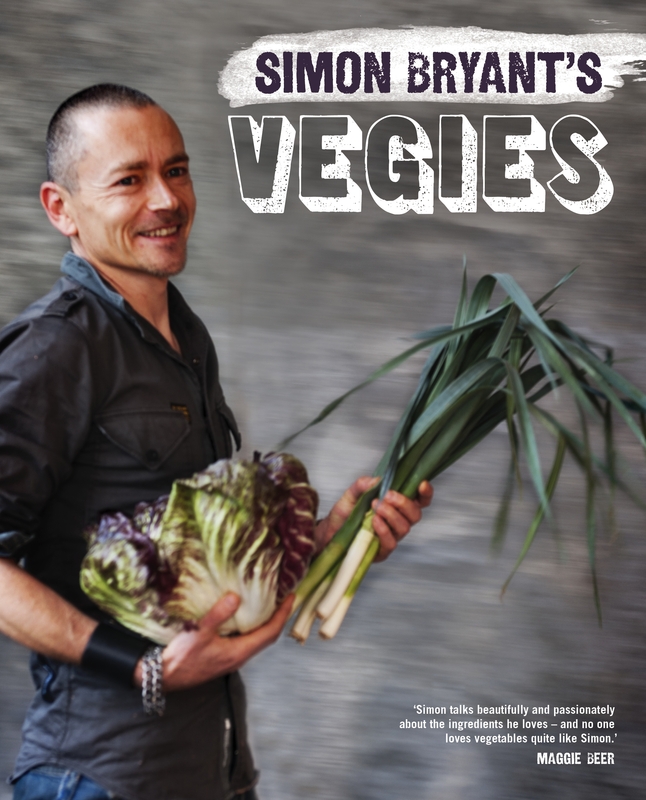 Simon is a champion of ethical produce and we are lucky to have him in Adelaide. Who knew you could get lentils from Kangaroon Island? We were also happy to finally meet the Kind Cleaner, who came and introduced himself. Paul is not only doing kind cleaning he is doing great blogging, and we love his regular posts. We know the food industry can go a long way to be more environmentally friendly, and this blog is a little inspiration for us! Be inspired by a kind Adelaidean here. We have met so many great people through this business, maybe I can work out a little blog special on all of you? So, what’s coming up for the Velo in the lead up to 2013? For starters Manu is doing work on the bicycle. Let’s be honest. It could be a bit lighter! It weighs a couple of hundred kilos and every little bit counts, so some weight loss is taking place. Then we are excited to be involved with Summer Fridays in the East end. Every Friday night from November 16th we will be in Ebenezer Place, with a great group of traders. Here we come Ebenezer on Fridays! We are promoting cycling a little more by being involved with Tour de Work. This is going to be great, and hopefully you are already involved. If not, finish reading this blog post and go online and get involved! World Vegan Day! Of course we will be there. Its still to be confirmed but keep the 18th November free and be ready to eat your way from one side of the park to the other. Lots of stalls and of course Veggie Velo vegan burgers. We will be doing a trial run of a new vegan burger patty to allow choice for our fans, very exciting! Veggie Velo is also going to be flipping burgers at a new market in Adelaide called ‘Damn the Man Night Market’. We’re not sure which man they want damned but we’ll be there to see. It’s in the beautiful Old Queens Theatre in the west of the city, on Thursday night 22nd November. Find out more here, then come along to see us please! Gilles Street will be wedging us in too, between James and his amazing Smooth Revolution, Pedal powered smoothies (and some lady who sells knick -nacks normally). Gilles Street is a great environment for us, lots of good tunes from the dj and lots of happy faces. Subtle promotion of our friend Jame's page here, these smoothies are seriously good! After all that we will be rolling into some parks about the city. We would like to try the west a little more, and would love to try Leigh street, Light square and Whitmore Square. One more thing! Manu was filmed for a little special on ABC t.v. It will be on the 7:30 Report, as a story about street vending. Erin, part of our Veggie Velo support crew was charming the camera and she and Manu we interviewed for the segment. Go veggie power go! So we hope to see you soon on the street. Thanks again for keeping us going, we appreciate each of you, and your veggie loving ways. As always, check our facebook page and our calender and maps to find us. Thanks guys, love your veg!